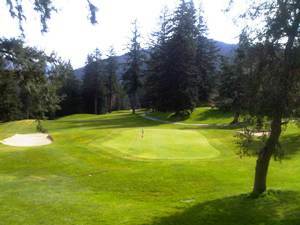 Sudden Valley Golf Course is part of the Sudden Valley gated community located on Lake Whatcom Boulevard about eight miles east of Exit 253 of I-5. The course was built on land owned by logger Glen Corning who sold 1,200 acres to Sudden Valley Inc. in 1968 for $1.8million (you can still see the red barn that was part of Corning’s horse ranch to the left of the 9th tee). Ken Sanwick, the CEO of Sudden Valley Inc., was an environmentalist at heart who envisioned his new acquisition as ‘Sudden Valley the Undevelopment’, an ambition that appeared at odds with his choice of golf course architect – Ted Robinson, who was known for his elaborate, not to say excessive, man-made water features. Indeed, Robinson’s company logo depicted flowing water and the man himself was often referred to as the ‘King of Waterscapes’. A prolific designer who created more than 170 courses (most of them in the western states including 26 in the Palm Springs, Calif area alone) during a 40 year career, Robinson is best known in Washington for his design of Sahalee Country Club in Sammamish, site of the 1998 PGA Championship and which this year hosts the US Senior Open. On Sudden Valley’s relatively flat and open front nine, Robinson showed considerable restraint, rejecting the waterfalls, fountains and ornate rockpools with which he adorned his other courses. Instead, he relied on Lake Whatcom and Austin Creek to satisfy his craving for aquatic adventure. After a gentle start, the course warms up at the 5th which plays towards the water, while the tee shot at the excellent 6th must carry a curve in the lake’s edge. At the Par 5 7th, another fine hole, the creek cuts across the fairway 20 yards short of the putting surface and must therefore be negotiated with the approach shot. The brook then reappears at the Par 4 9th, making a similar diagonal pass just in front of the green. The back nine begins with a right-angle dogleg Par 5, that plays considerably longer than its stated 498 yards, and then heads up a ridge and into the trees for a series of holes that typify golf in the Pacific Northwest. Tree-lined, without being unnecessarily tight, the closing eight holes are extremely picturesque and, if you can stay out of the trees, offer up a number of decent birdie opportunities, none better perhaps than the Par 5 17th where the tee shot must come up just short of Austin Creek which splits the hole roughly in two. Sudden Valley has hosted many major Northwest tournaments including the 1981 Washington State Open won by Rick Acton, five Washington State Men's Amateur Championships (1981 - John Bodenhamer, 1984 - Ted Himka, 1988 - Derk Hannigan, 1994 - Karl Smith, 2001 - Brock Mackenzie), a Master-40, a Washington State Senior Women's Championship, the Men's Mid-Am and numerous PNWPGA Pro-Am tournaments. The course, and indeed pretty much everything else at Sudden Valley, is now owned by the Sudden Valley Community Association which took control of the property in 1976. How can a 498-yard Par 5 possibly be the toughest hole on the course? 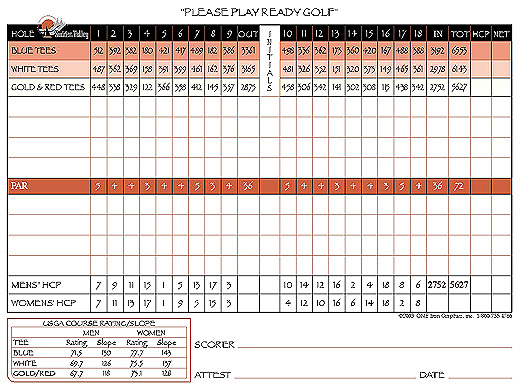 Golfers of even moderate length would hope to birdie a Par 5 this long half the time they played it. True, but these 498 yards play very long, and are fraught with potential danger. Because the hole doglegs viciously to the right, a fade is the ideal shot off the tee and, as everybody knows, a fade doesn’t go as far as a draw. Fail to impart that left to right sidespin, however, and it’s possible you might run out of fairway and end up in Austin Creek. What’s more, the second shot heads up a significant rise in the ground, effectively making the approach shot two or three clubs more than the yardage suggests (which, in reality, means most golfers should hit another driver). The pitch is not a difficult one and the green, like most at Sudden Valley, is relatively flat. So if you can strike two solid shots somewhere up near the putting surface, you’re on for a par of even a birdie. But it really isn't the last quarter of this hole that makes it so demanding. If it came later in the round, the straightforward Par 5 1st would be the choice here. But the first hole of the day is hardly where you’re most likely to hit your purest drive followed by a similarly solid 3-wood, hybrid or long iron, so a Par here normally works just fine. None of the other three Par 5s extend beyond 500 yards, so you might expect one of them to offer up more than its share of birdies. But again, for the typical amateur golfer, the combination of water, sand and length conspire to ensure far more sixes and sevens than fours. There are seven Par 4s under 400 yards, but none come without the threat of calamity. The safest hole for the club golfer, and that which he is most likely to master, might in fact be a Par 3 – the 167-yard 16th which plays significantly downhill to a large, flat green. Apart from bunkers on each side of the fairway, the 1st is pretty wide open but, as already stated, comes too early for you to be thinking about reaching a 512-yard hole in two shots (unless, of course, you had an hour’s warm-up and were hitting the sweet spot every shot on the range). The creek runs in front of the green at the 7th and will force most golfers to lay up with their second shot, and the green at the 10th is barely visible from where your drive comes to rest so severe is the rise up to the green. That leaves the 488-yard 17th. 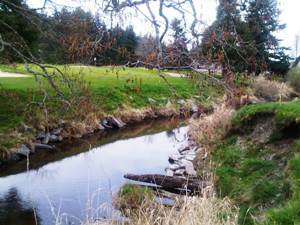 You must be wary of the creek that cuts across the fairway 270 yards off the back tee, but even from….. The 11th is the shortest Par 4 on the course but, at 336 yards from the back tees; 326 from the whites and slightly uphill, you’d have to be a Remax Long Driver to take it on. Plus, after seeing how closely the trees converge on the hole as you step to the tee, hitting a driver is probably inadvisable for many. Nothing makes the inadequate golfer feel quite so confident as a nice downhill tee shot. And when they’re as downhill as this one, the feeling of accomplishment as his ball soars high above the ground eventually dropping to Earth several seconds later is profound. The drive at the 16th falls almost 100ft, meaning even a ball caught low on the clubface is going to remain airborne for a few seconds. One of Sudden Valley’s best qualities is that, even at 6,553 yards, there are very few holes where taking a driver, and trying to get as far down the fairway as possible, isn’t a good idea, especially on the front nine. That’s not to say there are so few potential pitfalls you can smash away indiscriminately without a care in the world, but nowhere does the design of the hole actually force you to keep the driver sheathed. That said, exercising caution at the 11th, 12th, 14th and 17th may be the way to go. The driver will certainly see more action on the front nine, where only really wild tee shots will put you out of the hole. Open your shoulders at the 1st, 2nd, 3rd, 5th, 6th, and 7th. Then try and summon the force again at the 15th and 18th. Sudden Valley has championship pedigree but, in addition to challenge, provides ample entertainment for the less than championship golfer. There are numerous memorable moments, and several places where you can make up or lose ground. 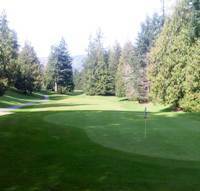 In short, it’s fun and, at $32 for 18 holes, affordable - precisely what a golf course should be, in fact.